Requiem for Charleston considers the events of June 17, 2015, when nine men and women were shot by a white gunman inside one of the country’s oldest historically black churches in Charleston, South Carolina. The installation consists of 25 tambourines whose drums have been replaced with black lambskin, referring to the quintessential symbol of innocence and sacrifice. Thomas inscribed nine of the tambourines with the names of the murdered men and woman; others were left blank in tribute to the many men, women and children who have died in attacks on black churches. Whatever the fun, there's no shaking the seriousness of this show’s intentions. Lava Thomas’s tribute to those murdered by a white supremacist at Charleston’s Emanuel African Methodist Episcopal Church points to the deepest fissure in American life: race. 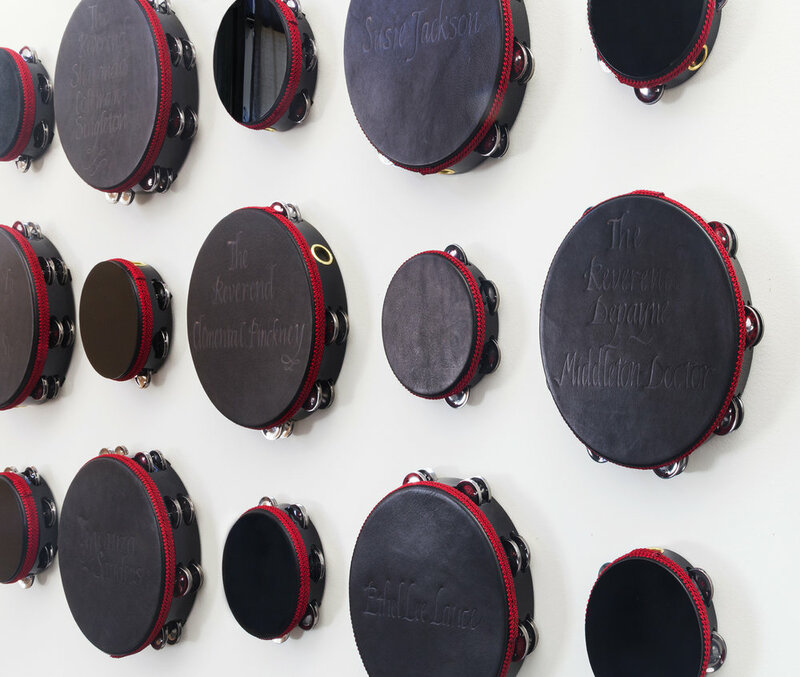 It’s a chevron-shaped array of wall-mounted tambourines covered in black lambskin, each of which carries the name of a victim embossed on the surface. This blunt, mute statement, standing in contrast to the gospel music evoked by the instruments, all but screams of the violence that claimed nine lives in 2015.